I'm building a Vic Smeed Mam'selle and intend to use a small outrunner electric motor. I've only recently returned to the hobby and this is my first attempt at building a vintage design with an electric motor (my last "vintage" was a Veron Cardinal in the 1970s with a DC Merlin ). I gather quite a few people have done this before but have been unable to find any pictures of how the motor was mounted. It seems to me that I'll have to remove the engine bearers to make space for the battery directly behind the engine former/bulkhead. I'm concerned that if so do this and still mount the motor on the bulkhead using the usual mounting box arrangement, then on the first heavy landing the bulkhead will snap off as it would now only be supported by the 1/8 by 3/8 balsa fuselage crutch and 1/8 by 1/8 balsa stringers. I could possibly move the engine bearers to allow space for the battery so that the bulkhead has additional support. I'm just concerned that this might simply result in crash damage being transmitted further into the fuselage, making it harder to repair. I realise that the answer to this may be that I shouldn't crash the plane ! However I've been flying a couple of foamies for the last year or so and guess have got used to their ability to bounce, or at least that they allow you to easily stick back together any bits that are knocked off. With the latter in mind I have toyed with the idea of using a lump of foam to create the motor box in the hope that this would absorb minor impacts without damaging the rest of the fuselage. I am concerned though that it would distort (especially after a few bumpy landings) so altering the motor thrust lines. The system I use when doing elecric conversions is this - I make a birch ply 'coffin' (rear open) to contain the battery (the whole length of it). Leave a little space inside all round (4-5 mm) for the inevitable battery size variation and a spot of velcro. 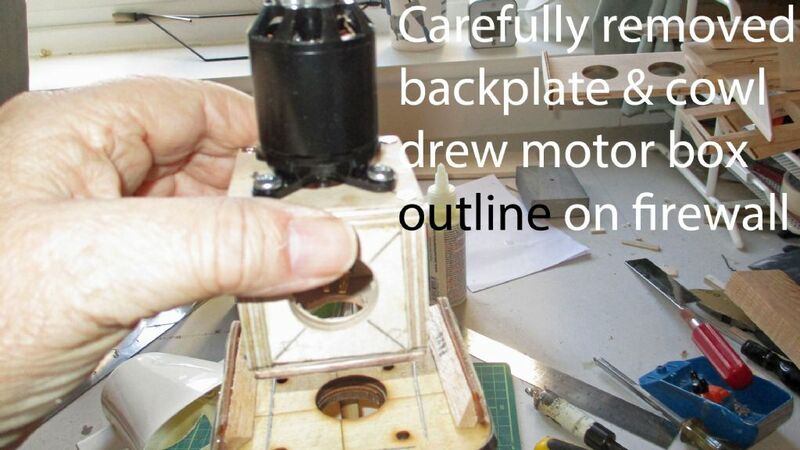 Mount the motor on the front of the box with a REALLY robust ply plate, preferably with blind nuts. Ensure that the inside of the box is free of things like bolt ends This coffin should be arranged to pass through F1 and F2 and well attached to both. The advantages are - the motor mounting is really secure. To tune the CoG, you can slide the battery for and aft in its coffin (sorry about the terminology! ), and should the worst happen, the battery is protected all round unless you have a severe crash going backwards! In a big crash - and I've had a few - the coffin, complete with motor and probably spinner and cowling , with F1 and F2, tends to separate from the rest of the fus, but remains as a unit and can be reattached to the reassembled debris. I don't know the structure of the Mam'selle, but I am sure you can adjust the concept to harmonise weightwise. The foamies I flew were indeed pushers, it's a very forgiving layout for a trainer. Obviously not going to work for my Mam'selle - maybe instead I could reverse the polarity on the motor and fly it as a canard  More seriously Chris there may be something in your suggestion around using nylon bolts , perhaps to retain the motor block. With the low power motor I'll be using small diameter nylon bolts would be strong enough to hold it firmly in place but would hopefully shear on impact. I use the 'coffin' method described above on nearly all my glow-to-electric conversions. It avoids using stand-offs for the motor (since electric motors are usually shorter in length than the i.c. ones they're replacing) and, most importantly for most models, it allows you to get the battery as far forward as possible, to get the c. of g. right. It usually involves cutting a large rectangular hole in the original firewall and, often, cutting bits out of the next two formers, to accommodate the long 'coffin'. If you crash seriously enough to displace a strong motor mount what is going to happen to the rest of the air frame? The original engine bearers also protected the engine itself which was a relatively expensive item but brushless motors are cheap (and don't thrash about) so it may be better to have a mount rigid enough for flight but that will crush/break thus absorbing some of the forces of a crash so minimising the damage to the rest of the air frame. IMO it's pointless trying to make a model crash proof & a lightweight model like the Mam'selle isn't likely to sustain much preventable damage even in quite a tumble anyway. However the motor shaft & prop often bear the brunt of any hard "arrival". As previously mentioned this can be avoided by using a folding prop but a simpler method for a low power model would be a "prop saver", only real downside is that you won't have a nice spinner. Here's a link that illustrates & explains them. Some motors come with a prop saver as one of the included extras these Keda motors for example. In fact the 2217/16 would probably be a good match for the Mam'selle. Hi Alan . Build it to fly and not to crash . Mods that are too strong only pass the force of a cash further down the line. The Mamselle is a brilliant flying model so why should it crash ? Mine is now with it's second owner and about 15 yes old. I flew it hundreds of times with an old Mills 75 . Covered in light span the only signs of its age is some slight discoloration and a few tiny patches on the covering due to a bit of hangar rash. With electric power it should last indefinitely. Good luck . Alan, I just realised that the motor I gave the link for is front mounted only when using a prop saver. But the prop savers are sometimes included with other small motors. They are also available as accessories from as Hobbyking & other retailers in several shaft sizes.